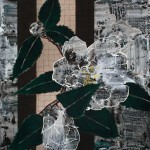 For painter and collage artist Robert Kushner, “decorative” is never a dirty word. Robert Kushner, Malinalco, 2014, oil and acrylic on canvas, 90 x 120 inches. 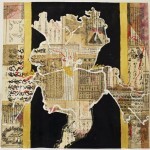 Robert Kushner, Heraldic Iris, 2012, oil, acrylic, gold leaf, and collage on paper, 28 x 28 inches. 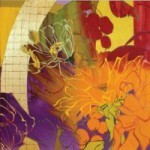 Robert Kushner, Starlight, 2012, oil, acrylic and palladium leaf on canvas, 48 x 48 inches. Back in the ’70s, when Minimalism and Conceptualism were the rage in the American art world, just about the worst thing a work of art could be was “decorative.” Suspicious of beauty, worried about lack of seriousness in the aftermath of Pop Art’s great commercial success, artist and critics deployed the “d” word with deadly intent, aware that it could sink a body of work or even a career. But one group of artists—among them Kim MacConnel, Joyce Kozloff, Betty and George Woodman, and Robert Kushner—actually took the term as a badge of pride. They launched a movement they called Pattern and Decoration (P&D), which took inspiration from the realm of crafts, acknowledged the traditional contribution of women to visual culture, and proudly raised the banner of sensual beauty. Kushner, now 65, is still devoted to the decorative, creating a variety of works that all embody his belief that art can and should bring pleasure to the eyes while still stimulating the mind. Kushner’s latest work is actually two bodies of work—large-scale floral-themed paintings and smaller-scale collages that combine found typography and calligraphy with old photographs and prints, and fragments of textile, all layered with painted floral elements and bands of color. The floral paintings build on his longtime interest in botanicals, and even though these are by no means straight naturalistic renderings, Kushner is quite specific as to which species he is riffing on. 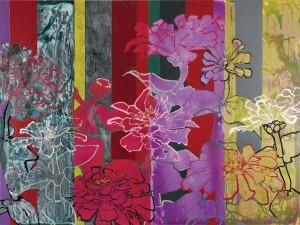 The canvases are titled as if they were pages from a florilegium—honeysuckle, bellflower, rudbeckia, fern, daylily, phlox, quince, and rosa rugosa. 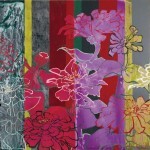 The colors Kushner uses in this series are bright and cheerful—purple, light green, royal blue—a change from his previous series, in which the flowers defied expectations by appearing in black, white, and a silvery tone that looks as if it were created from an exposed daguerreotype emulsion. In all of these paintings, there is a constant play between positive and negative space; flowers and leaves will switch colors as they pass from one band of contrasting background color to another, sometimes seeming to appear in outline, other times filled in. Space is subverted by the paradoxical combination of wallpaper-like flatness and the illusion of depth induced by the layering process. Adding to this slightly disturbing sensation, the flowers seems to enter the picture from somewhere else; they are never fully contained by the frame. The eye is kept guessing, or at least working hard—Kushner’s concept of pleasure does not include tolerance for visual laziness. When he first started exhibiting, at the age of 25, Kushner, along with many of his P&D colleagues, did very well, despite the stated anti-decorative bias of the art world. He had shows at the Whitney, was championed by the critic Amy Goldin, and sold plenty of work through Holly Solomon Gallery. “Then all that disappeared,” he says. “So what do you do? Keep on working! Keep it alive, take all these sources, have it be vivid and present in my studio. I’m making the things I want to see.” He’s having success in the market again now, exhibiting regularly at several galleries around the country. 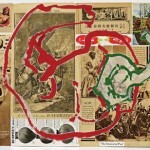 He also makes print editions of his works to put them in the hands of a broader base of collectors.